I’ve been holding off reviewing the Troy-Bilt Vortex 2890 snow blower because I wanted to see if this snow blower has the same issues as it’s fraternal twin, the Cub Cadet 3X 28. As you know my slogan here is “It’s not what I think is best. It’s what is best for you.” I feel that for most of you this is not the right snow blower. Let me state right up front – this snow blower is advertised for heavy, deep snow – it’s just not the best choice for most of us. Note, I don’t have one of these to test. I live in a weird area of the country where my closest Lowes/Troy-Bilt Dealer is over 100 miles away. I only have the videos that Troy-Bilt has published on YouTube and owner reviews. I am basing my opinion on that public information and my experience with high speed spinning sheet metal augers. I know, the other major review site gave this snow blower a “Best Buy.” The stated in their tests it blows damp sawdust really, really well. But sawdust is not snow. Snow is never consistent like sawdust. This snow blower has problems with any type of snow other than the heaviest, deepest snow. In other words – “Normal” snow is what this snow blower has problems with. I trust what CR does, but they seem to confine all of their opinions of snow blowers to specific tests. So even though they consistently test every snow blower the same way, it appears they missed how the 3 stage is not the ideal snow blower in other conditions than their test. It will be interesting to see if they change their rating when they try to clean their sidewalks with this snow blower. If you regularly get 14 inches or more of heavy, wet snow this may be the right snow blower for you. If you live in upstate New York. If you live in a “snow belt” like Cleveland, Buffalo or Hammond this may be a good choice. Why is this snow blower not for most of us? In my non-engineering mind there are four parts to this 3-stage system. The augers on either side of the front gearbox. These auger flights are the same as a 2 stage and they are designed to chew up snow and push it towards the center of the machine. The rear auger. 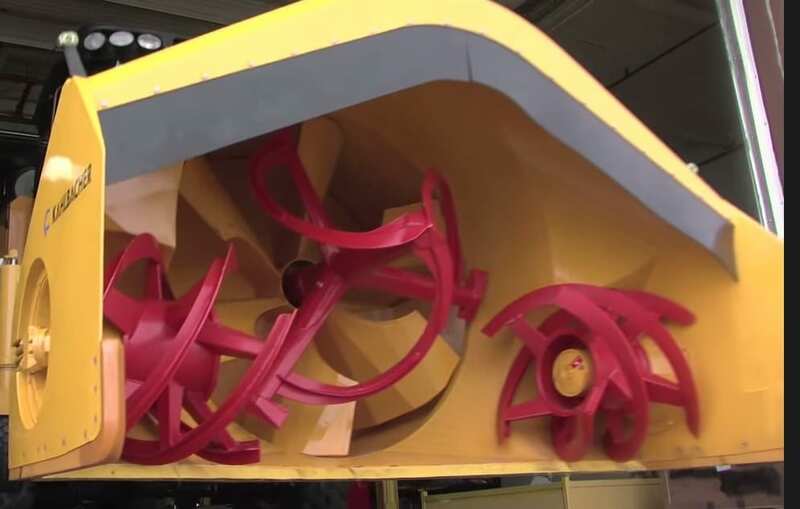 Back, behind the gearbox is an auger flight that is shrouded on the top and is designed to pull the snow from the two outer augers and the front “Accelerator” into the impeller at high speed. If snow gets to this auger it appears to pull it in quickly to the impeller. The “Accelerator” (front auger) is supposed to chew up the snow and send it into the rear auger. It appears that this works well on heavy. deep snow but anytime you have 6 inches of snow or less it just splatters snow all over your freshly cleaned driveway. The problem appears to be two-fold. First, the auger is spinning too fast so it won’t “catch” small amounts of snow and pull it into the rear auger. 2nd this problem is aggravated because the auger is the not tapered. In other words that big spinning chunk of steel causes more snow to be thrown off to the sides by inertia than what it grabs and pulls into the rear auger. Why MTD wants to charge so much for this snow blower is beyond my understanding. They changed the front gearbox, put a larger engine and added a 4 blade impeller. Other than that there is no re-engineering. There is not enough “new” on this snow blower to warrant a $300 price increase over the Troy-Bilt Storm 28in. Electric-Start 2840 Snow Thrower – 277cc 4-Cycle Engine, Model# 31AH54P4766 . Can the design be fixed? I’m all for new ideas. “I’ve always said, “If it ain’t broke – fix it.” I know we can find a better way to move snow than the way we’ve been doing it for the last 50 years. I also know there has been a dozen or more variations on the “3-stage” design and none of the designs have become common place. The specific piece that needs to be engineered on this unit is the front auger. It looks like MTD just took an auger flight from their 2-stage machines and stuck it on the front. I feel if they create an open flight auger or one that is tapered like the end of a screw this design would work very well. Another feature that the snow blower pictured here includes is a top skirt to help keep the snow inside the snow blower housing. I already bought it and now I’m stuck with it! What do I do! There have been a few reviews where the new owner has gotten past the 30 day return policy for the retailer they bought it from and now they are stuck with their Vortex. I have a few suggestions to help you live with your machine. Leaving Piles of Snow: When you come up to the end of a run and then back up all snow blowers leave a little snow. The Vortex appears to leave more snow than most but there is a way to minimize that pile. When you get to the end of that run stop the forward motion of the snow blower and let the auger/impeller run for few seconds. Let it run until snow stops coming out the discharge chute. I know this sounds like common sense to some, but many of you have never owned a Troy-Bilt Snow Blower before. As you get more experience you can also plan your snow clearing so that you don’t have to back away from a building or landscape features as often. It’s Throwing Snow All Over: When blowing certain types of snow, especially less than 6 inches of light fluffy snow the front “accelerator” tends to throw more snow out of the snow blower than it pulls in. But the snow blower is consistent – it always throws out the front to the right. So plan your clearing so that the unblown snow is always to the right. For my driveway I would start in the middle, blow that section (run) and then turn around to my left and make the next pass and keep going counter clockwise until the driveway is cleared. I would always keep the uncleared area to my right. You can also speed up. If you only have a few inches and the snow blower is just making a mess try moving faster. If you can handle it physically, increase the forward speed one or two gears and see if that helps. The Vortex is advertised as a high capacity machine and you may not be loading it enough for it to blow snow well. Plugging Up: Some new owners are stating the snow blower plugs up all the time. Every snow is different but as you get more experience with the snow blower you will be able to tell what to do. First, if it is plugging up try taking only 1/2 width of snow. If it is plugging up on the snow plow drift out front you may have to take only a 1/4 pass. Breaking Shear Pins: You are going to break shear pins on the front “accelerator” if you hit stuff. Chunks of ice, frozen newspapers, pop cans, etc. But if it is breaking shear pins for no apparent reason first try only taking 1/2 pass. If that reduces the breakage then your snow is just to hard. (wind blown drifts can get so hard you can walk on them) You may have to take only 1/4 or 1/2 pass until you get that snow cleared. If it is still breaking shear pins take it to your authorized dealer and see if there is something bent out of spec. There have been two reviews where the Vortex is breaking both the front and rear “accelerator” pins. This may something you hit and bent the whole shaft or it may be a factory defect. The servicing dealer will be able to tell the difference. ALWAYS USE ORIGINAL EQUIPMENT SHEAR PINS. NEVER USE BOLTS! Ok, you get the point that this snow blower is advertised as a high capacity snow blower. It supposedly did such a great job of blowing saw dust that it was given a best buy rating by another review site, but I feel it is not the snow blower for most of us. Even Troy-Bilt’s own video shows the Vortex Throwing snow all over the place. Nice Review i’m a big fan of it as well i did a quick video review of mine if it helps anyone make a more informed choice, of purchasing it. Hi Nick, I noticed that your 2890 pulled you along at a pretty fast pace. Did you have it is first gear when you went into the snow piles? Hi Ted, The Craftsman 88394 at Sears is a good machine for your size drive in Chicago. 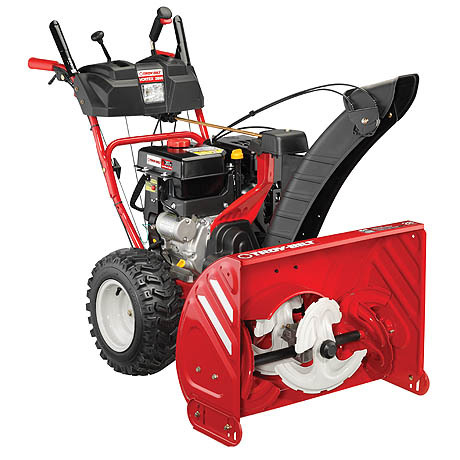 28″ 243cc Dual Stage Snowthrower with Quiet Engine . I disagree with your review. Without actually testing in 2-6 inches how can you ‘review’ this? I have the 2890 vortex 357 cc unit, live in the midwest, and have cleared 2+ inches of snow with it. there have been none of the issues you mention here. It is a finely built machine, and smart purchase planning involving timing of a coupon and a lowes 15% off sale sweetens the price where I ended up paying 895 plus tax, a tremendous value for this type of machine. Hi Mukund, I appreciate your comment. If you would please go to this article and watch the video. The snow blower is 2490 instead of a 2890. After you watch this feel free and come back here and if you would, tell us the difference.